One of our Christmas traditions is making a gingerbread house. We never had gingerbread houses in my childhood, but I loved the magic of them in stories of Hansel and Gretel: an edible house, covered in sweets - the food of every child's dreams. This is a quick, simple melt-it-down, one pan method for yummy gingerbread, which I originally got from a kids' TV show! I have adapted it a little, but it's still super simple. My children range from 2-7 and all helped in all the processes bar one. Sticking the house together with molten toffee is an adult's only job. Please be careful! I manage to burn myself every year! We decorate it all together, so it is homely rather than super-fancy, but if it was too pretty we wouldn't want to eat it, and that's half the fun! My children love making it as much as eating it. It gets softer and chewier the longer it is left out. 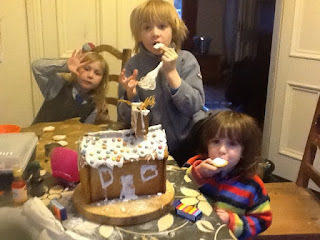 We usually admire ours for a couple of days before demolishing it with friends for a festive tea party. First make the gingerbread. Melt sugars, syrup and butter gently in a pan. Remove from the heat. Stir in flour and spices. Stir until combined. Pour onto a non stick sheet of parchment. Roll out to about 2mm thick. Cut out. 2 long walls 10 cm x 25 cm - you can cut doors and windows out of it now, or ice them on later. 2 end walls 10 cm wide with a triangle on top. Two roof pieces 25cm x 8cm. Chimney:four pieces 2cmx 4cm, cut a triangle out of the base of two so it attaches to the roof. Cook for 10-15 mins, keep a careful eye on them so they don't go too dark around the edges. Cool on a wire rack before icing. Un-iced they keep well for a couple of weeks in an airtight tin, and are crisp. Iced they keep fine but are soft. Whilst they are cooling, melt the sugar for the toffee in a pan until it is light conker colour. (remember no kiddies involved here!) Do not stir! Take off heat as it will continue cooking. Plunge into a bowl or sink of cool water. Then quickly, but carefully, use a spoon and run a line of toffee down the inner edge of one of the long wall, super fast, attach a short wall to it. Do the same with the other two walls. Then the rooves, and then stick the chimney together in one piece before attaching it to the roof. If the toffee starts to cool and get too hard, just pop it on the heat for a couple of minutes to soften. Then mix up the royal or water icing. Use a piping bag, or spoons to cover the roof, make snowy windows etc. Cover with sweets as you go. Chocolate buttons cut in half or overlapped make great roof tiles!